In this video series I discuss essential topics that every patient with atrial fibrillation should know. To better answer that question, we first must identify what a cure means. My strict definition of a cure for atrial fibrillation is that through either a procedure, medication, or a lifestyle change a patient has zero episodes of AFib for the rest of their life with absolutely no symptoms. If we adhere to that definition, unfortunately, the answer is no; there is no cure for atrial fibrillation. 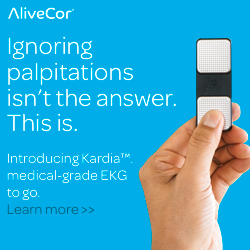 While there may be a few instances of people that either received a medical procedure or made a lifestyle change and they never had AFib symptoms afterward, whatever treatment strategies they received cannot at this time be applied to the entire population of people diagnosed with atrial fibrillation. The proof is in the pacemaker. Let’s look at AFib patients with pacemakers for example, since someone with a pacemaker always has their symptoms recorded through the pacemaker. Even if this patient receives treatment, such as an ablation procedure, the pacemaker will still likely show small but insignificant episodes of atrial fibrillation. While the episodes have improved, the number of AFib episodes are not zero, residual symptoms of AFib may or may not still be present, and while drastically improved the atrial fibrillation is not cured. Even with small episodes of AFib the risk of stroke is still present. While atrial fibrillation is unfortunately not curable at this point in time, this does not undermine the value of atrial fibrillation treatment. An ablation procedure, such as a catheter ablation or surgical ablation, or even lifestyle modifications through weight loss or sleep apnea treatment, can dramatically improve symptoms of AFib. However, I've seen patients in the hospital who had procedures done with extremely successful outcomes, were told they didn't need medications anymore, and unfortunately, the first signs of AFib recurring several years down the road resulted in a stroke. While treatment can drastically improve a patients experience with atrial fibrillation, it’s important to understand that it won’t result in a 100% cure. Are there natural treatments for AFib? In this video series I discuss natural treatments for atrial fibrillation including diet and exercise, sleep apnea, stress management, and weight loss. In conclusion, if you have a procedure done for atrial fibrillation, whether it's a surgical procedure or catheter-based ablation procedure, atrial fibrillation is still a chronic condition that requires chronic management. Any residual symptoms of atrial fibrillation, the risk of stroke, and risk factor modifications; such as high blood pressure, diabetes, obesity, and sleep apnea, are still areas that need chronic attention. With the right treatment strategies, you can dramatically reduce the amount of AFib you're having and significantly improve your quality of life. My most commonly asked AFib questions! Does Weight Loss Improve Atrial Fibrillation? Newer PostCan Weight Loss Improve your AFib? Older PostWhat is a Cryptogenic Stroke?